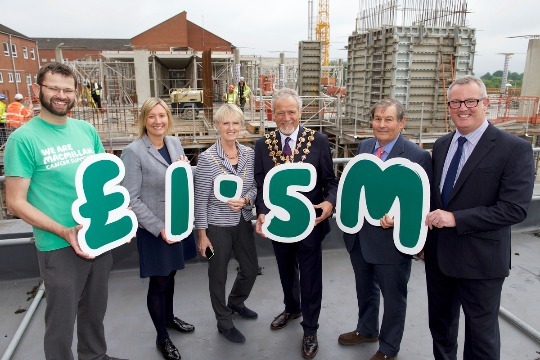 The Chesterfield Royal Hospital has teamed up with Macmillan Cancer Research who has pledged to commit £2.5million to the £8.9million cost of a new, purpose built Chesterfield Royal Macmillan Cancer Centre. The fundraising campaign will last for 18 months and should draw to a close shortly before the centre is due to open. 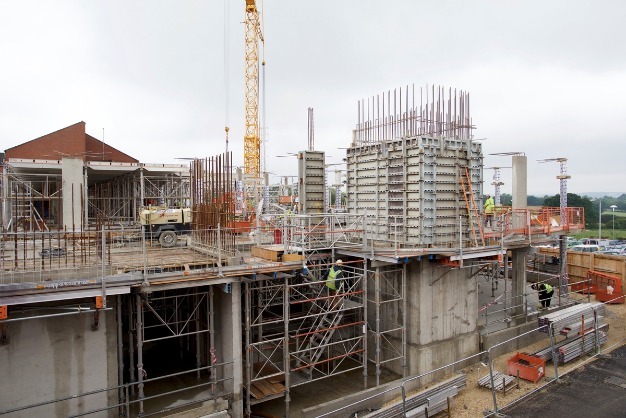 It is hoped that work on the centre will begin this Autumn and be completed by the end of 2016. ​NGS donation takes us closer to our £2.5million goal! The Trust’s £9million cancer development has officially recognised a massive donation from the National Garden Scheme to change the name of the unit to the NGS Macmillan Unit. The NGS donated an incredible £1.5million which was acknowledged at a celebration at the Royal on Tuesday June 14th 2016 during which other supporters and fundraisers were also invited to see what work had been done and how the centre was progressing. The scheme’s new name is the latest development for the project that will change the way cancer services, care and treatment is delivered for our patient by bringing all of the different elements of cancer care under one roof. ​The Royal’s Lead Cancer Clinician, Dr Roger Start (pictured below speaking to the guests), said: “We know that there is now a one in two chance of developing cancer in our lifetime and that there are more treatments available that are more effective. This means that people are living longer and our approach to the treatment of our patients needs to reflect the fact that a greater percentage of our local population will need treatment for cancer. This new building will allow us to deliver quality care for these patients in a more appropriate environment. ​The new state of the art new centre will provide all cancer services and treatment in one place, delivered by a team of specialists. A garden will also be created at the centre offering a relaxing and holistic space where patients and carers can spend time and reflect during cancer treatment and after care. ​The NGS has given over £15.2 million to fund 147 Macmillan professional posts and service projects since the partnership first took root in 1985. The NGS has 70 gardens in the Derbyshire area and a portion of the money raised locally from all of these gardens’ openings has contributed to this donation to help the people of Derbyshire. For more information about the new centre or information on how to get involved in supporting Macmillan’s £2.5 million appeal click here, call 0300 1000 200 or contact local area fundraising manager Steve Loane on sloane@macmillan.org.uk or 07801 307045. 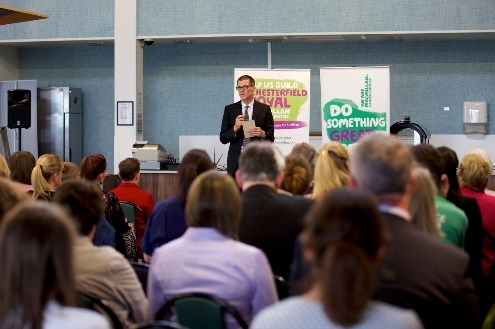 To see more pictures you can view our gallery from the event which you can see by clicking here. 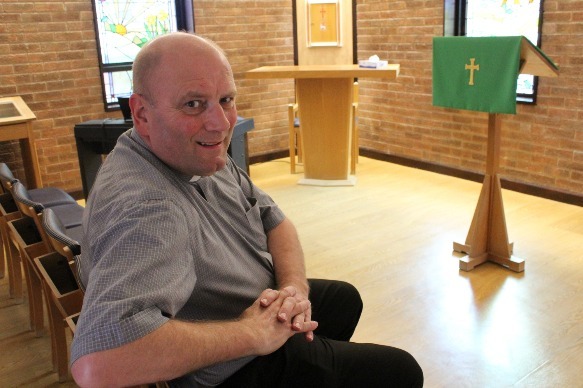 ​Our hospital chaplain is taking on a 135 mile cycle challenge to go from the West to the East coast. The journey starts once the back wheel is dipped in the sea at Whitehaven and doesn’t end until the front wheel is dipped in the salty waters off Sunderland three days later. 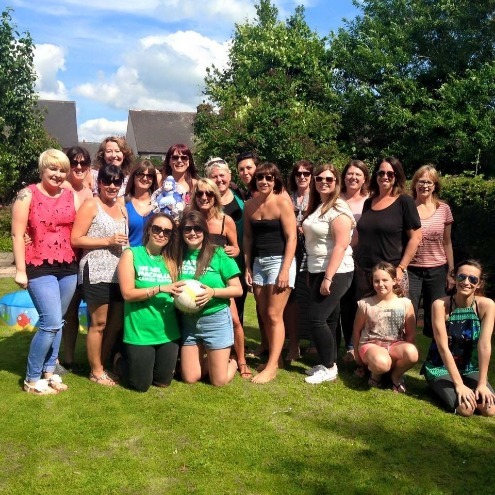 Colin Barrick is undertaking the coast to coast challenge along with Steven and Leanne Herniman after Steven lost his mother to cancer, they’re using the challenge to raise money for the NGS Macmillan Unit appeal. Colin has his own personal reasons for wanting to raise money for the new unit, which will bring all of the trust’s cancer services under one roof. Just 18 months ago he fought his own battle against cancer. “I’m in recovery for Non-Hodgkins Lymphoma which was diagnosed in November 2014,” explains Colin, “and thankfully I’ve responded well to treatment. I had a course of Radiotherapy at Weston Park but was under the care of the doctors here, going through it made me approach my work in a different way. I was frequently seen in outpatient suite 4 speaking to patients so I think it was a bit of a shock for them and some of the staff that I suddenly appeared there for treatment. “I had been sitting with people who had been fighting for their lives and then suddenly I was with them which was a humbling experience. It led to me supporting people through their treatment and it did impact my role here; you see things in a different light once you’ve been through that and your outlook on life changes. If you would like to donate to Colin’s challenge then you can do so by visiting his Just Giving page which you can visit by clicking here. ​Congratulations to one of our most recogniseable fundraisers, Derek Kipling, who was honoured for his efforts last night. 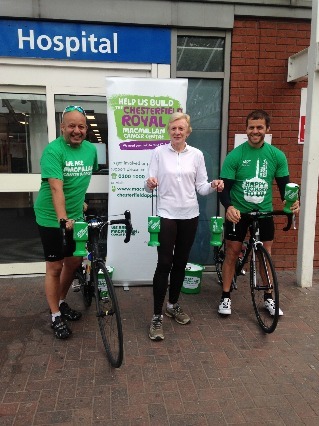 If you've visited the hospital at any point in 2015 then, chances are, you will have seen the smiling face of the gentleman on the right standing outside the main entrance, quietly and unassumingly raising money for the Chesterfield Royal Macmillan Cancer Centre. He has stood there, come rain or shine, with a collection tin and so far raised more than £6,500 on his own. 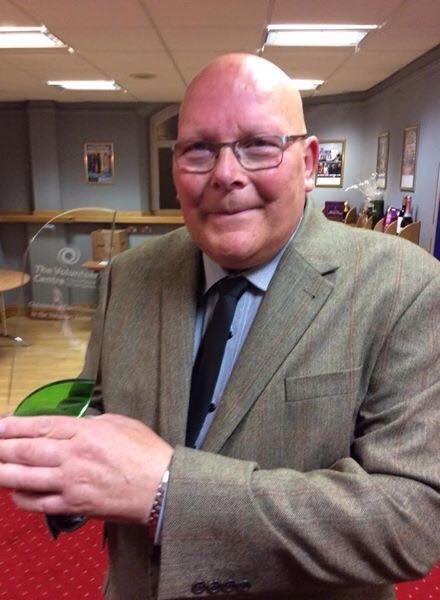 This incredible dedication earned him an 'Outstanding Achievement Award' at the Chesterfield Voluntary Sector Awards at the Pomegranate Theatre in Chesterfield on Wednesday 14th October 2015. 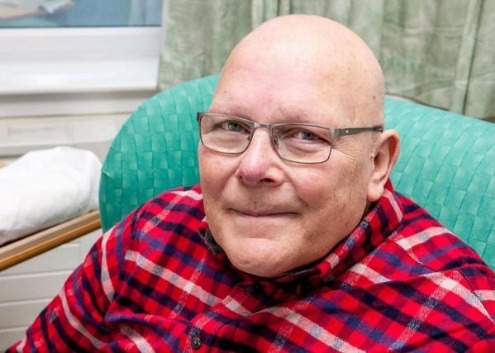 It is such a well deserved honour and anybody who has taken the time to speak to Derek can't fail to be won over by his warmth, kindness and genuine enthusiasm to the cause for which he's chosen to fundraise. From everyone at the Royal and Macmillan Cancer Support, a huge congratulations to Derek and thank you for your continued support. 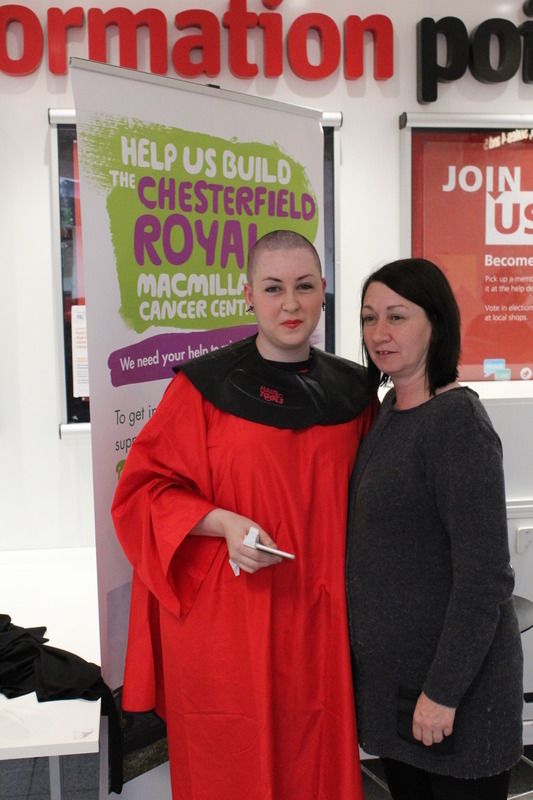 Our fantastic and very brave Emma O'Connor, who works at Cafe@theRoyal, had her head shaved in the main entrance information point in aid of Macmillan's appeal. Emma is very proud of her hair and takes great pride and care when styling it each day so it took a tremendous amount of courage to not only take the plunge and take it all off, but to do so in a public place! There were lots of donations from passers by and Emma's next job is to collect all of the money she has been pledged in sponsorship. 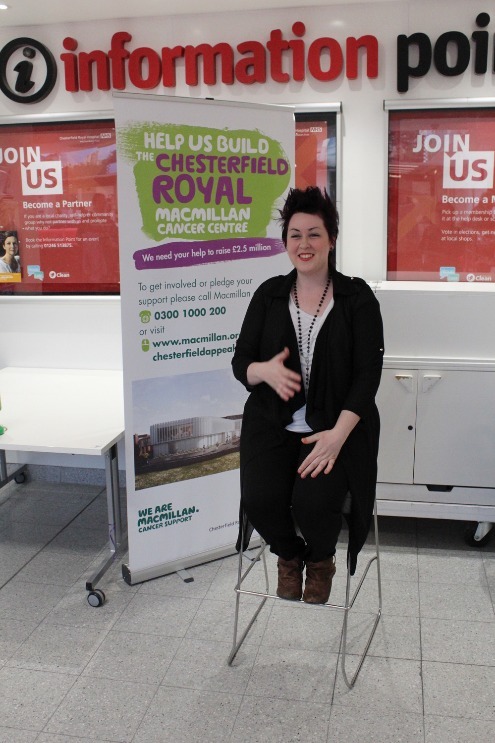 ​The Critical Care team has gone all out to raise money for the Royal Macmillan Cancer Centre and so far raised just short of £5,000. 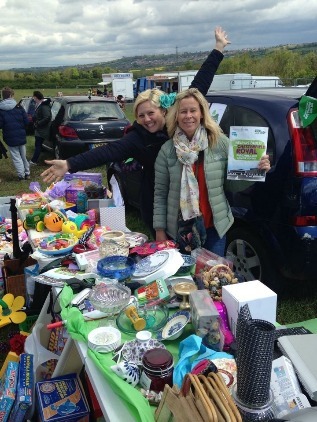 They have organised a series of activities and events which include a garden party and netball event (see photo, left), two car boot sales (see below) and some individual achievements that include a mammoth 180 mile bike ride from the Chesterfield Royal to Skegness and back. Colorectal Surgeon Robin Gupta and former patient Mark Jackson completed the incredible journey and actually cycled 200 miles due to diversions put in place by the Highways Agency on the A1. It's a particularly poignant achievement for Mark who overcame his own personal battle with cancer and, as an amateur cyclist, this is an amazing effort. Between them they raised more than £2,000 (see photo below, left). 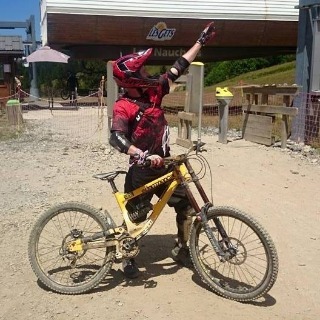 Consultant Anaesthetist Jon Cort completed his own challenge on two wheels in the Alps, money is still coming in for that one. Congratulations to everyone involved within Critical Care, an inspiration to anyone looking at ideas for their own fundraising projects. One of our cancer patients has been doing some incredible work fundraising and, if you've been to the Royal in the past couple of months, chances are you've seen him at our main entrance. Derek Kipling (left) was diagnosed with prostate cancer in 2008, undergoing Radiology treatment at Weston Park in 2009 with regular checks and injections here at the Royal ever since. His cancer can't be cured but is being managed by our team here and is an active member of the Prostate Cancer Support Group that meet in Calow on a monthly basis. Derek has raised more than £2,000 already simply by standing outside the main entrance with a collection tin which demonstrates both his determination to help in the fundraising effort for the Chesterfield Royal Macmillan Cancer Centre but also the generosity of those who have so far put in. 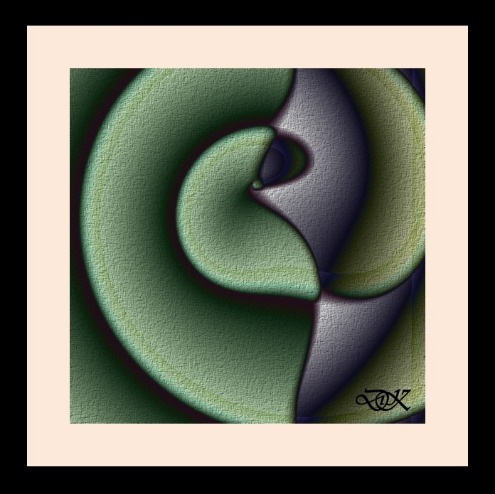 But Derek isn't just a kind heart with a determined mind, he's also a very talented digital artist and, on top of his incredible efforts outside the main entrance, he has sold some of his work to raise even more money. Derek held a stall in the main entrance on Monday 13th July to sell from one of his collections and the response was amazing. 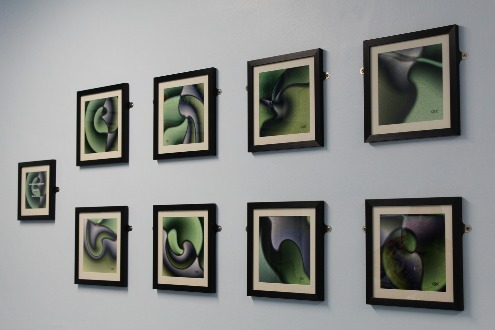 Derek said: "I brought along 31 pieces of art work from by 'Within Colour' collection (see left for example) and I sold 24 of them on the day raising £333 for the Macmillan appeal. I'm delighted with this and had a wonderful time meeting a lot of interesting people and talking to them about my work and why I'm helping the appeal. 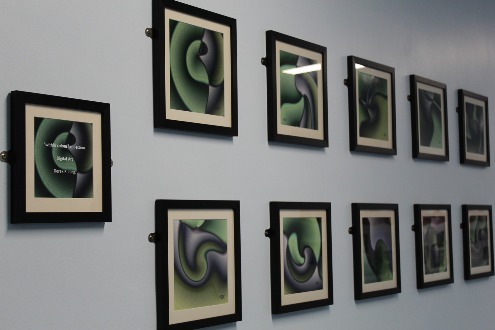 You can see more of Derek's pictures on the 'Blue Diamond' corridor just next to the entrance to outpatient suite 5 where Derek has donated a collection for us all to enjoy (see pic below). 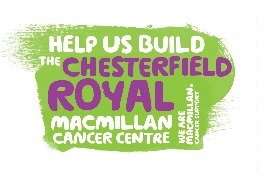 If you would like to make a donation to the appeal then you can visit the Chesterfield Royal Macmillan Cancer Centre page by clicking here.